Bharatiya Janata Party (BJP) leader Subramanian Swamy on Monday urged the Delhi High Court to summon 11 witnesses related to the National Herald case. "Today I have been given permission to summon eight documents by the court which are partially from the Congress party and partially from the Associate Journal Pvt. Limited. In addition, I also wanted to prove the authenticity of the documents. So, I asked for 11 witnesses to be summoned and the court said to make a consolidated list and file it and after vacation we will hear you on July 1. 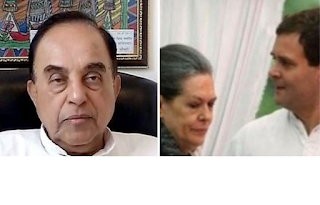 In the hearing, the court will decide whether to send Sonia Gandhi and Rahul Gandhi for trail or not," Swamy told . Recently, the Delhi High Court gave its nod to an Income Tax probe in the National Herald case. Earlier, the Patiala House Court had allowed investigation of income tax of the Gandhis, which was then challenged at the Delhi High Court. Swamy had filed an application in 2012, accusing Congress chief Sonia Gandhi and her son Rahul and others associated with the Congress of conspiring to cheat in the land deal.